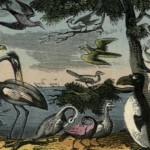 A collection of copyright free fictional bird images where the original illustrator gave the birds human traits. 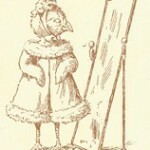 The birds are the original characters of the books and can walk, talk, and do a variety of other activities not normally performed by birds. 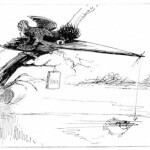 A charming cartoon of a bird fishing. 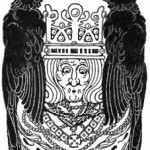 Two ravens give a king advice. 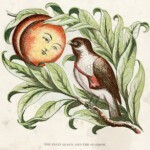 The sparrow takes a moment from delivering mail to speak to the fruit queen. 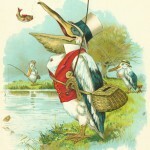 A dapper pelican fishes for his supper. 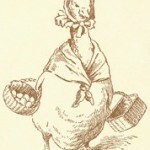 Mamma goose brings her eggs to market. See the pretty chick in the mirror there? 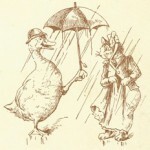 A gentleman offers a lady shelter from the rain. 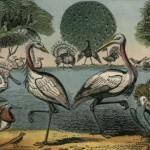 A variety of birds preen and primp to go to the Peacock’s house. Walk, swim or fly; but just get there. 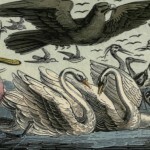 Fun image of the dance. 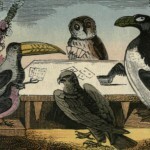 A free downloadable image of birds playing cards. 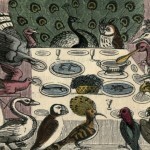 Fun public domain image of birds at a tea party.